Thanks to the folks at E One Entertainment for the awesome contest! The British Hit Crime/Drama series "Broadchurch: The Complete Second Season" will be released on DVD May 5, 2015! So how do you enter...... Keep reading. Just tweet me your favorite character and why. That it! Three (3) winners will be picked at random. I will contact you using Twitter and/or Facebook. Please only ONE entry person person. No matter how you enter. Duplicates will NOT be accepted. Must enter using FACEBOOK or TWITTER. Thank you. ** Contest End Date 6/5/15 11:59pm ET. ** GOOD LUCK!! New York, NY/Toronto, Canada – Called “a bona fide national obsession”, the critically acclaimed second season of the top-rated British mystery series BROADCHURCH returned to the U.S. airwaves this March on BBC America. 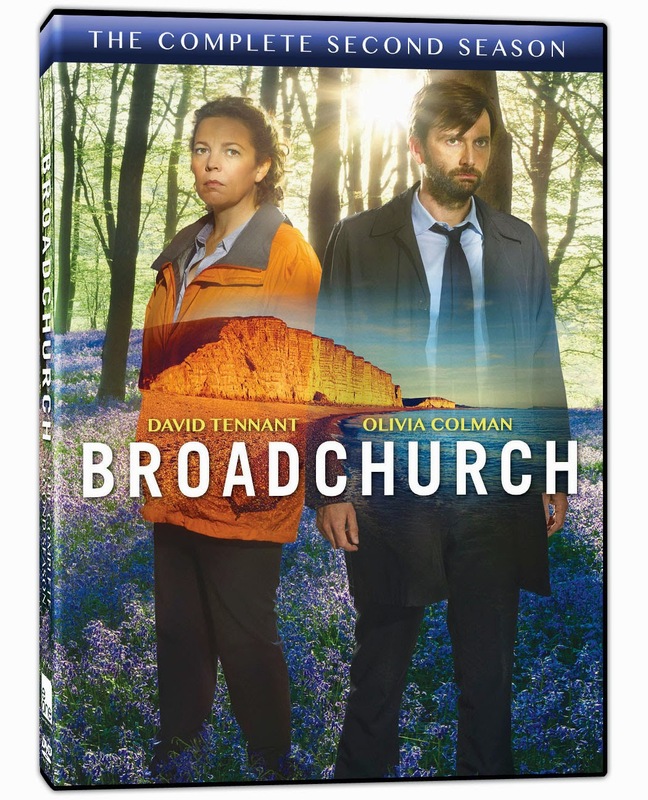 And on May 12, mystery buffs, TV DVD aficionados and anglophiles are invited to return to the stunning Dorset coastal town of Broadchurch for more mystery, heightened drama, and taut thrills with BROADCHURCH: THE COMPLETE SECOND SEASON, a 2-disc DVD set from Entertainment One. In THE COMPLETE SECOND SEASON, David Tennant (“Doctor Who”, Harry Potter and the Goblet of Fire) returns as Alec Hardy and Olivia Colman (The Iron Lady, Hot Fuzz) resumes her role as Ellie Miller, last seen having her life torn apart as husband Joe confessed to murdering local schoolboy Danny Latimer in the seaside town. And in the eight gripping episodes of Season Two, the focus is the trial for Latimer’s murder, as well as the return of a murder case that continues to haunt Detective Hardy. Additionally, this season, Hardy and Miller are joined in highly acclaimed roles by Emmy® nominated film and television actress Charlotte Rampling and Academy Award®, BAFTA and Golden Globe®- nominated Marianne Jean-Baptiste, as well as James D’Arcy (Cloud Atlas, Hitchcock, Jupiter Ascending), Eve Myles (“Torchwood”, “Merlin”, “Little Dorrit”) and Phoebe Waller-Bridge (Bad Education, Blandings, “Glue”). In addition to the eight complete episodes, the BROADCHURCH: THE COMPLETE SECOND SEASON set also includes numerous special features sure to enthrall fans of the series, including: “The Making of Broadchurch”, “Behind-the-Scenes” featurettes, deleted scenes and cast and crew interviews. Consumers interested in streaming or download can purchase Season Two episodes of BROADCHURCH from all major digital platforms. Individual episodes are available the day following their premiere on BBC America, and the complete series will be available following the airing of the final episode. BROADCHURCH is executive produced by Chris Chibnall (The Great Train Robbery, “Torchwood”) for Imaginary Friends and Jane Featherstone (“Utopia”, “The Hour”, Spooks) on behalf of Kudos, a Shine Group company. The Producer is Richard Stokes (“Silk”, “Law & Order: UK”) who also produced the first series.